Conversations about refugees have reached phones, social media, news networks and now, even puppets. 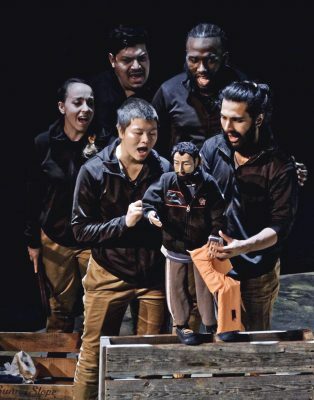 Vermont-based Sandglass Theater employed the latter in their show, “Babylon: Journeys of Refugees,” which played at the Puppet Showplace Theater at Suffolk University’s Modern Theatre Thursday, Jan. 24, to Saturday, Jan. 26. According to a study guide of the show by Sandglass Theater, the name of the production comes from the the ancient city of Babylon in present-day Iraq. The Babylon Exile refers to the forced detention of Jews in the Kingdom of Babylonia just after the year 600 BCE. The study guide said the name “Babylon” is a metaphor for the destruction and destabilization of a refugee’s homeland and tries to address the living situation of refugees. Susie Hernandez, 31, a Suffolk alumna, attended the show Friday. With a bilingual background, she said she volunteers to help asylum seekers adapt to the United States. Hernandez said the show used “a lot of kind and respectful expressions” while telling stories. Roxanna Myhrum, artistic director of Puppet Showplace Theater, said a workshop hosted by Eric Bass, a co-founding artistic director of Sandglass Theater, and his daughter, Shoshanna Bass, inspired her to invite “Babylon” to Suffolk University. The workshop focused on gathering community stories and being truthful in performance while straying from any cultural appropriation, according to Myhrum. “As a presenter of the work, one of the things we wanted to do was to connect back to the refugees in Boston,” Myhrum said. After the show, a conversation was held as part of the Ford Hall Forum Public Discussion Series. The show’s director and ensemble performers were joined by Suffolk faculty members Iani del Rosario Moreno, Ragini Shah and Rev. Amy Fisher. Myhrum said the post-show conversation was a way to bring expertise from other fields to the topic of refugees. Accordingly, she said they hope that audience members channel the energy stemming from the performance to follow-up actions. During the talk, the audience shared diverse understandings of a character named Gretel, a German war ghost. Gretel holds an important role in helping white audiences empathize with refugees from Africa, Muslim countries and Central America, according to the study guide. Ines Zelles Bass, a co-founding artistic director of Sandglass, said during the conversation that Gretel’s character was based on her aunt — who went through a similar kind of hardship fleeing from what used to be part of Russia to the west. “Babylon” ran as part of the 45th season of “Puppets at Night,” a series hosted by the Puppet Showplace Theater. According to their website, the target audience of the series is adults and teenagers, and the theme of this year, “Puppets for the People!,” seeks to present works that engage in human communities and inspire action. Myhrum said the series is a way to “build bridges” between people and among communities. CORRECTION: A previous version of this article mislabeled the Puppet Showplace Theater at Suffolk University’s Modern Theatre as Suffolk University’s Puppet Showcase Theater. An updated version reflects this correction.